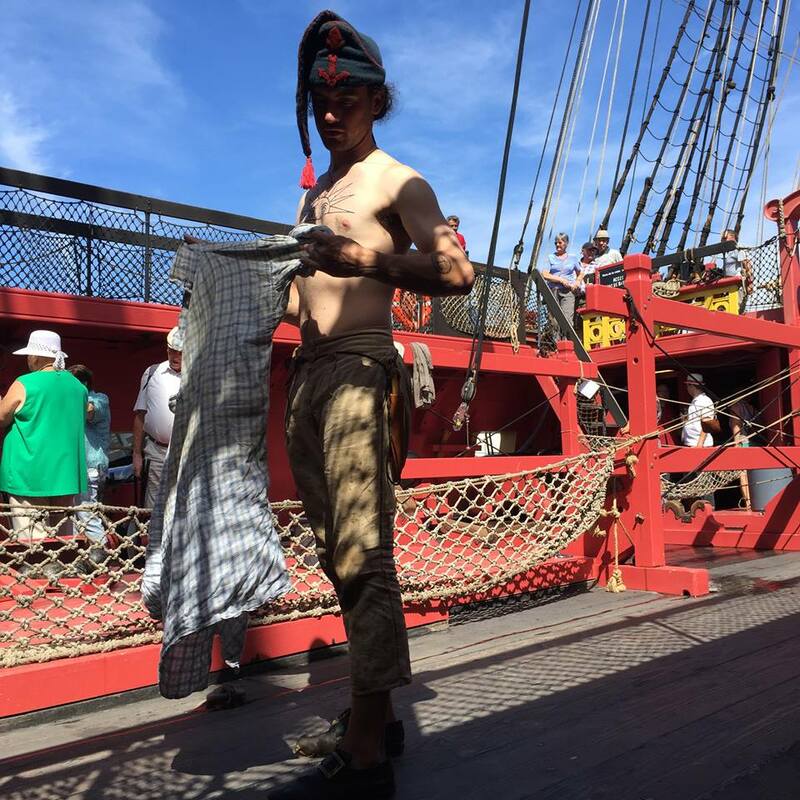 I ascended the side of the ship, and, finding no one on deck, I lay down in my wet clothes, and putting my hat under my head, slept soundly all night. When I awoke in the morning, I found that I was unable to move in consequence of my clothes adhering to the pitch, which the heat of the climate caused to ooze from the seams in the deck. Recently Paul White raised the question: how did sailors do their laundry afloat? In the evening I was called into the cabin to sign Articles, where I found the captain's wife and his sister at work, ironing some washed clothes. As she was very tractable, sprightly, and wiling, she soon was caressed by her messmates, for whom she would very readily either wash or mend their linen, or stand cook, as occasion required. Traditionally feminine tasks like sewing, cooking, and laundry often fell to men afloat. Entire ships were often completely devoid of women. It has been suggested that sailors' hypermasculinity and strongly avowed aversion to the idea that homosexuality was rampant afloat was in part a reaction to the requirement that they be competent in tasks outside their gender sphere. This is not to say women were not present at sea at all, nor that they did no laundry when they were. Suzanne Stark, in her book Female Tars: Women at Sea in the Age of Sail says this is the case, and that women on men-of-war sometimes used fresh water to launder shirts for the sailors (for a price) because salt water tended not to dry out. She suggests that laundry was expected to be done with salt water. Stark quotes Admiral John Jervis, 1st Earl of St. Vincent: 'the women, who still infest His Majesty’s ships in great numbers, will have water to wash, that they and their reputed husbands may get drunk with the earnings.' In 1796 he instructed his captains to reprimand the women of the fleet for wasting fresh water. The actual mechanics of laundry at sea are one of those details that were so mundane as to go unrecorded in most sources. However, by taking a look at this menial and routine task, we can reflect something about attitudes toward women at sea. While not bad luck, women could be seen as a nuisance by naval commanders, even when assisting with essential tasks. But the common sailor might welcome women (and women posing as men) if they could take on a traditionally feminine task that the sailors themselves bore only out of necessity. Fox, Ebenezer, The Adventures of Ebenezer Fox in the Revolutionary War, Boston: Charles Fox, 1847, pages 215-216. Cordingly, David, Seafaring Women: Adventures of Pirate Queens, Female Stowaways, and Sailors' Wives, New York: Random House, 2009, pages 244 and 246. Kelly, Samuel, Samuel Kelly: An Eighteenth Century Seaman, Whose Days Have Been Few and Evil, edited by Crosbie Garstin, Frederick A. Stokes Company, 1925, page 72. Snell, Hannah, The Female Soldier; Or, The Surprising Life and Adventures of Hannah Snell, London: R. Walker, 1750, in The Lady Tars: The Autobiographies of Hannah Snell, Mary Lacy and Mary Anne Talbot, Tucson, Arizona: Fireship Press, 2008, page 10. For the life of me I cannot find the paper in which this idea was put forward. The idea is not my own. It is hinted at by Stephen Berry: Berry, Stephen, A Path in the Mighty Waters: Shipboard Life & Atlantic Crossings to the New World, New Haven: Yale University Press, 2015, page 161. Stark, Suzanne, Female Tars: Women at Sea in the Age of Sail, Annapolis: Naval Institute Press, 2017, pages 56-57.